Attendees: Cllr J Wodey (Chair), Cllr K Higgins (Vice-Chair), Cllr M Burgess, Cllr G Morgan, Cllr A Pryke, Cllr C Pragnell, Cllr P Smith, Cllr B Bottomley, Cllr Janet Blake and 50 members of the public. Olivia Stapleford, Senior Planning Enforcement Officer at Buckinghamshire County Council attended the meeting to provide an update on the status of CM/0005/18 and to answer questions posed by residents. 50 residents attended the meeting and made comments on the following; planning application a) CM/0005/18, b) 18/00183/APP, the proposal to have a one way system in place in Ivy Lane, traffic issues in High Street South and the World War 1 Exhibition in November. 3. Declaration of interest in items on the agenda: to declare any interests. None were registered. 4. To confirm the minutes of the previous PC Meeting on Monday 5th February 2018 and deal with any matters arising not covered on the agenda. The minutes were agreed and signed. a) CM/0005/18 – Red Brick Farm – Stewkley Parish Council are waiting for the Planning Officer’s report on this application, which will determine if it will come before Devcon Committee. b) 18/00183/APP – Four agricultural buildings and temporary rural workers’ dwelling – Land off Dean Road – The Parish Council have considered more detailed information on this planning application and resolved to OBJECT to the application with more detailed comments, relating to inadequate access for high volume HGV traffic, disposal of waste, bio-security for existing agricultural businesses, change of use etc. a. High Street South – Traffic – The Parish Council provided information to a concerned resident on the parking outside of their property and will be consulting with PCSO Megan Harriet on vehicles potentially parking dangerously. b. CU Phosco – Griffin Fields – The Parish Council resolved to pay the outstanding £7791.19 as the warranty document for the works carried out in Griffin Fields is now in hand. c. East West Rail – Update – The Clerk to invite the Stakeholder Manager at Network Rail to our next Parish Council meeting. d. Best Kept Village – The entry form, together with maps and information, needs to be submitted before the end of April. Details from the organisers say judging will take place this year on a single day between June 1 and July 7.
e. Parish Conference – Notes – The Councillors acknowledged the updated provided by Cllr. Smith. The conference organised by AVDC Commercial Services, covered mostly planning issues. f. Councillor and Parish Clerk – Advertisement – The Parish Clerk to liaise with the Parish Council and The Grapevine on the insertion of two advertisements. g. Dates for Annual Parish Meeting – The 2018 meeting will be held at the village hall on May 21st. h. B&MKALC Conference 19 April 2018 – Attendance – Possible representation from the Parish Council to be confirmed. 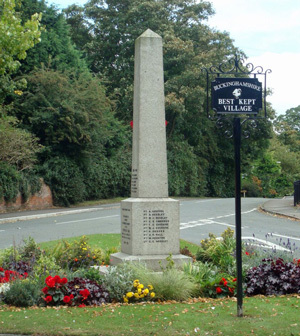 i. Buckinghamshire Minerals and Waste Local Plan Proposed Submission Consultation – General queries – The council will draft some comments for this consultation. j. Buckinghamshire’s Draft Freight Strategy (2018-2036) – Individual comments to be submitted by interested parties. 7. Broadband: Gigaclear has updated Cllr. Higgins. Progress is being made up HSN and another crew is being considered to make good the lost days from the snow. The design for Central Stewkley and High Street South works is being progressed. 8. Neighbourhood Plan: Cllr Morgan is in the final stage of coordinating comments/suggestions made by Cllrs and Janette Eustace will coordinate comments by the Steering Group. By the end of March, we expect to have review comments back to our consultant who will prepare a second more detailed draft. 9. Recreation Ground: To note any outstanding requirements and agree on any actions; Cllr. Bottomley updated the Council that the Adult Gym Equipment is due to be erected on April 9th. The Council also received confirmation that the REC toilet is being repaired and consideration being given to transform it into a disabled toilet. Status of repairs to roads – Proposed repairs to Bletchley Road seem at odds with SPC’s own priority for HSN to Mursley. Traffic Calming – Cllr. Higgins commented on the need for Speedwatch volunteers. Trees – Cllr. Bottomley confirmed the completion of tree works in Manor Drive which have been well received by concerned residents. 11. Stewkley Wildlife Reserve: To discuss and authorise expenditure incurred or actions required; A receipt for batteries £20.90 was received. Councillor’s General Items: To report on meetings attended on behalf of the Parish Council and agree whether to add to the next agenda. Cllr. Morgan queried the status of the right of way closure at Cricketers Corner and dangerous on-street parking by contractors on the site. The Clerk to request an update. Cllr Pragnell queried the parking of vehicles on grass verges in the village. The Clerk to discuss with residents. Date of next meeting: The Next Parish Council meeting will be on April 3rd at 7.30pm.